We have reached a huge milestone… or at least this is what I think. Adam is one year old!!! Oh My! How could this happen? I remember the first days when I had problems with the breastfeeding and now he is one year old! Everything happened so quickly. Being a parent can be wonderful and rewarding, but it can also be difficult and unpleasant. This is what Ivan and I learnt in the last year. I used carob powder to make the ganache. Carob is a tropical pod that contains a sweet, edible pulp and inedible seeds. After drying, the pulp is roasted and ground into a powder that resembles cocoa powder, but does not have the same flavor and texture of chocolate. Carob is naturally sweet, low in fat, high in fiber, has calcium, and most importantly no caffeine – that’s why I chose to add this to Adam. Place the ganache’s ingredients into the kitchen blender and blend until smooth and creamy. Place it in the fridge to chill. In a bowl mix together the flours, baking powder and vanilla. Add the smashed bananas, rice milk. Give the mixture a stir, combining the ingredients until mixed and smooth (if you find it too thick add a bit of rice milk 1 tablespoon at a time). Set aside for 5 minutes to allow the batter to rise. Prepare a non-stick pan with 1 teaspoon coconut oil on medium heat. Spoon batter into pan, forming a pancake. Cook until lightly brown on the bottom. Turn and brown the other side. Let the pancakes cool. To build the cake, place one pancake on a plate, spread some chocolate ganache on pancake and top with another pancake. Keep doing this until you’ve used all the pancakes. Keep some cream back for the top. I love butternut squash. It’s a versatile vegetable that can be roasted, toasted, puréed for soups, or mashed and used in casseroles, breads, and muffins and cakes. I love that the squash has a sweet, nutty taste. It is also a good source of Vitamin E, Vitamin B6, Folate, Calcium and Magnesium, and a very good source of Vitamin A, Vitamin C, Potassium and Manganese. We should eat as much as we can during fall and winter. This lentil salad is a good example to eat a bowl of healthy lunch full of protein, vitamins and minerals. Did you know that lentils have the third-highest level of protein, by weight, of any legume or nut, after soybeans and hemp? Soak the lentils for at least 3 hours (or overnight). Drain then put into a pan with fresh water and a pinch of salt and cook for about 20-30 minutes until tender. Line a baking tray with parchment paper. In a bowl mix together cubed butternut squash with 3 tablespoons olive oil, cinnamon, salt and chili powder. Place the mixture in the baking tray and bake at 170-180C (350F) until tender (about 20 minutes). In a bowl mix together cooked lentils, baked butternut squash, chopped red onion and 1 tablespoon olive oil. Season to your taste. 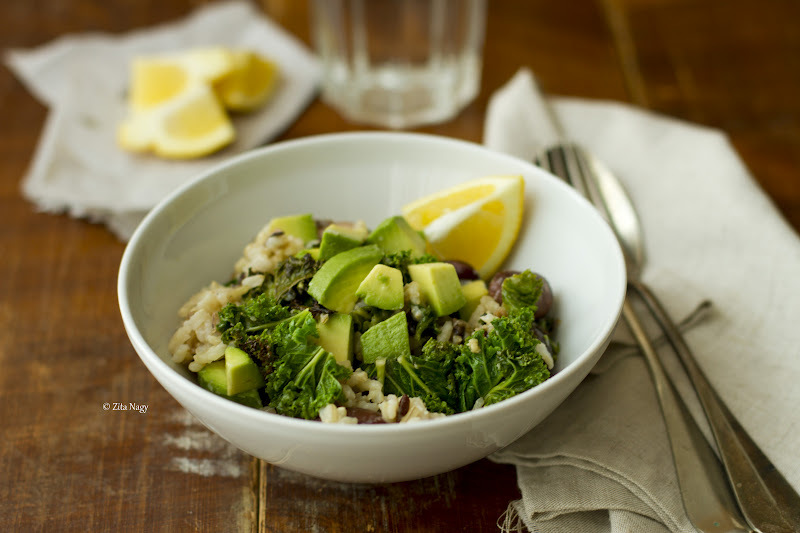 Serve with avocado. One of my bucket list places is the Grand Canyon National Park in Arizona, USA; a powerful and inspiring landscape that overwhelms our senses through its immense size. And if we are there we surely won’t miss the one and only entertainment capital of the world, Las Vegas in Nevada. The resort city is known primarily for gambling, shopping and fine dining. It is famous for its consolidated casino-hotels (here is a tip where to stay for the first time) and associated entertainment. I found a few good restaurants in Vegas with vegetarian (Mexican menu) and vegan options too. If we are there we’ll definitely try these places. Both of them look really good and I’m always amazed if a restaurant has delicious vegetarian and vegan meals to offer. Which places are on your bucket list? Anyway, back to my yum Mexican taco and quesadilla. Here you go, two easy to make weekdays dinner recipes! To make the butternut squash mix: heat two tablespoons of olive oil in a pan, add chopped onion and saute for a 2-3 minutes. Next stir in the diced squash and cook for 8-10 minutes. At the end add black beans, season with salt, pepper and smoked paprika. Cook for 4-5 minutes then set aside. To make the tacos: toast tortillas (both sides for about 2 minutes) over an open flame or in a non-stick pan. 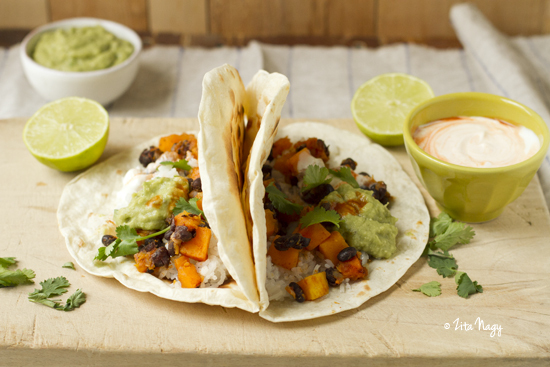 Fill the tortillas with the butternut squash mixture, top with cooked rice, guacamole, chili sour cream, sprinkle with chopped coriander. Serve with lime wedges. Repeat with the remaining ingredients. To make the quesadillas: heat a non-stick pan and place one tortilla in the pan to warm. Sprinkle with grated cheese, spread some butternut squash mixture and rice over the cheese, sprinkle with cheese again and top with a second tortilla. Cook for 3-4 minutes, then flip it over and cook until the bottom is browned and the cheese is melted, another 3 to 4 minutes. Repeat with the remaining ingredients. Slice and serve with quacamole, chili sour cream and fresh coriander. To make the guacamole: scoop out the inside of the avocados. Mash it with a fork. Add chopped onion, garlic, lime juice, season with salt, pepper and chopped coriander. Not exactly! 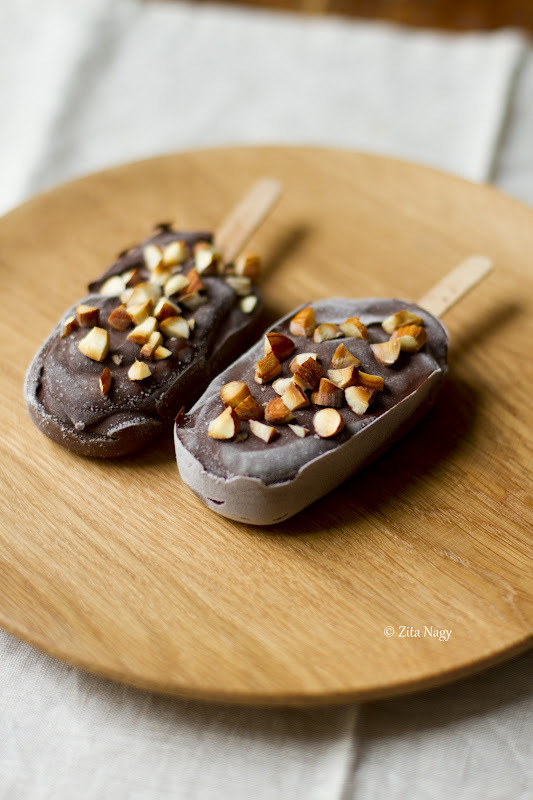 We had creamy, thick chocolate-y vegan popsicles to enjoy! Yum! 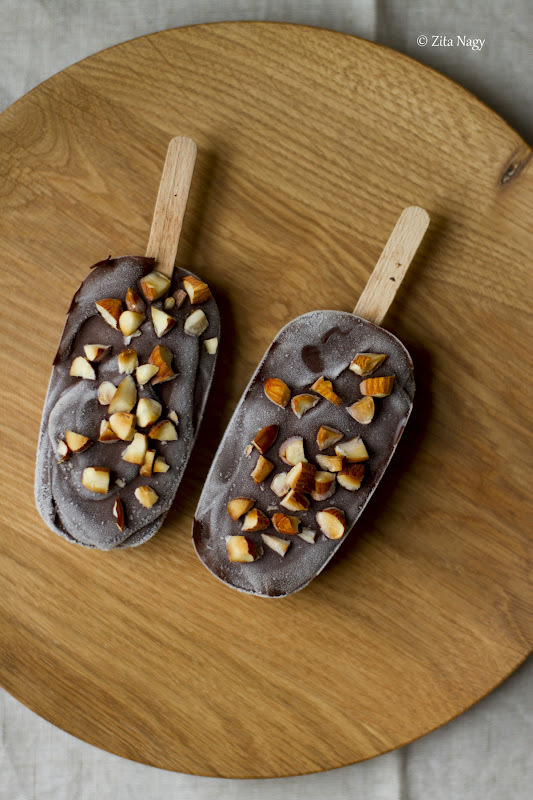 It’s easy to make and I dare to say it is the healthy version of chocolate popsicles. Roast the almonds in a dry non-stick pan for 5-6 minutes. Set aside to cool, then chop them roughly. Place all other ingredients in a food processor then blend everything until smooth. If you find it too thick, add a little bit more almond milk. 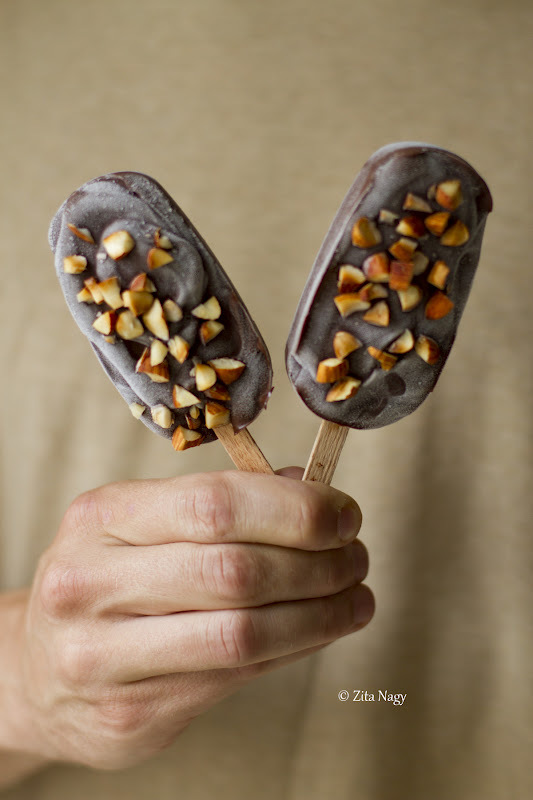 Put half of the roasted almonds into the popsicle molds, then pour the chocolate ganache cream over the almonds. Sprinkle the remaining almond over the top, insert sticks and freeze until solid (at least 2 hours). The other day I was emailing back and forth with my Travel Belles editor friend, Margo about pushing our businesses to the next level. “It is so much work and not much light yet at the end of the tunnel…” she said BUT we know we will see it someday soon. I have a day job and in the meantime I’m “building” my freelance business and it’s going so slowly. Healthy, vegetarian and vegan eating is not very popular in Hungary and most people are meat eaters so my audience is small but I believe in this that’s why I carry on doing it. People are getting more open day by day. It is also difficult to do this blog thing in 2 languages, I’m always behind with the translations! I wish I could do this all day (developing/testing recipes, learning food styling, taking photos, traveling, writing articles, etc.) but I can’t. One day, one day… I’m sure my work dreams will come true! About the recipe… I made this salad twice. First with kale, second time with spinach. Both worked very well. I was inspired by Jodi’s recipe (chek out her wonderful blog) but I changed a few things. 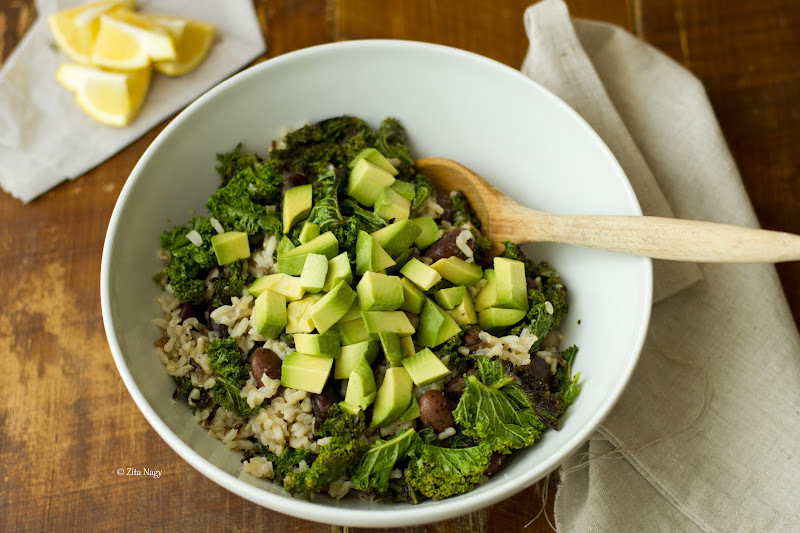 You shouldn’t miss this salad, it’s so nutritious and rich in protein. Start by cooking the rice in one saucepan and the beans in another ( 1. bring the rice and water – about 3 cups – to boil, reduce heat, cover and simmer until the water absorbed, 2. bring the beans and water – about 2-3 cups – to boil, reduce heat and cook until beans are tender). Meanwhile prepare the dressing. In a bowl mix together all the ingredients until combined. Heat coconut oil in a non-stick pan, saute garlic for 2-3 minutes. Add chopped kale/spinach/swiss chard, season with salt and pepper and cook for about 10 minutes. 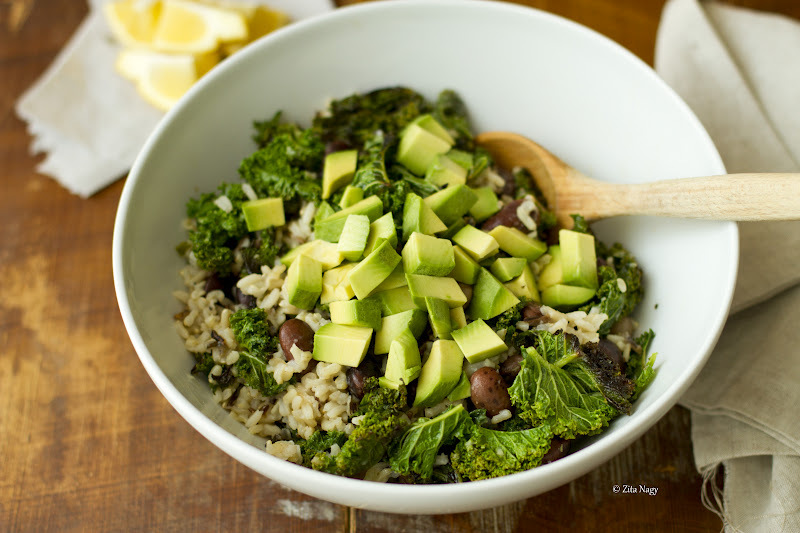 In a large bowl toss everything together: cooled rice, beans, kale, avocade and the dressing. Serve immediately. New post? Get instant notification!